You are here: Home / Blog / Drinks / Strawberry Basil Moscow Mule Cocktail – Oh Yes! 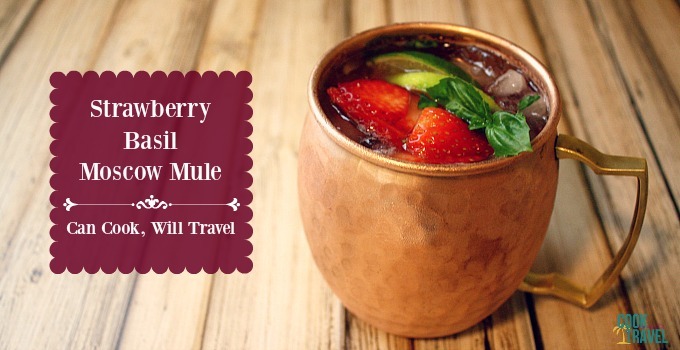 Strawberry Basil Moscow Mule Cocktail – Oh Yes! I’ve been out of town for over a week with my family. We had such a great time relaxing, trying new restaurants, and day tripping to Arkansas. 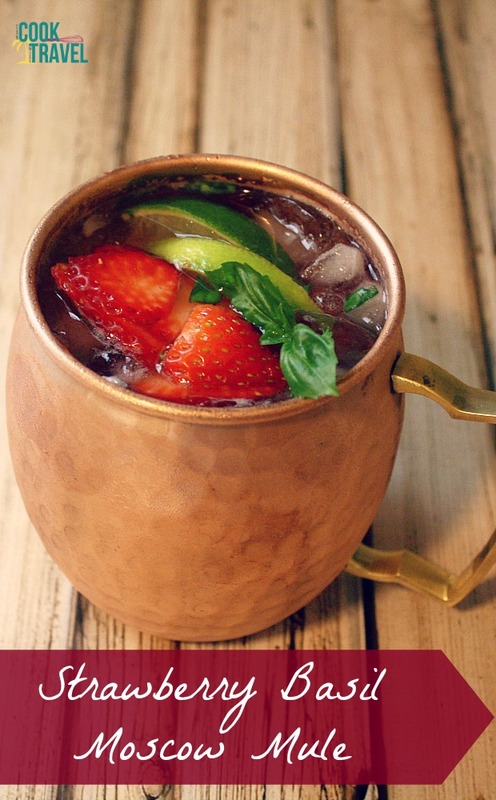 Now that I’m back I was looking for something really easy to whip up for you this week, and that something ended up being this Strawberry Basil Moscow Mule Cocktail. Maybe you’re thinking the long week with the fam led me to make this Strawberry Basil Moscow Mule Cocktail, but that’s so not the case. It was a relaxing and fun week, yet I am so happy to be home. Plus I was excited to see that I hadn’t killed all of my plants off while I was gone! So while I have a ton of basil, I was happily looking for some great ways to use it up. And the instant I saw the recipe on Pinterest, there was no looking back! Plus I’m a little in love with my Moscow Mule copper mugs, and it gave me a chance to use them again. I mean they’re seriously gorgeous! So there I was this week running out to the store to pick up some fresh strawberries, fresh limes, ginger beer, and some vodka. Sounds like a full meal, right?! And before I knew it, this Strawberry Basil Moscow Mule Cocktail was ready to go. The cocktail couldn’t be easier to throw together. Just cut up some strawberries, tear some basil leaves and muddle it with a little lime juice and ginger beer. Then add in the vodka. Finally lots of ice and more ginger beer and you’re ready to go. I’ll be honest that I wasn’t so sure about the flavor combo at first. I love strawberries and adore basil, but together I wasn’t so sure. So I added a little agave to the cocktail before the vodka and that really sent the drink to a whole new level. And with every sip it just got better and better. You’ve got the sweetness from the strawberries and agave, a little savory from the basil, and a nice brightness from the lime and ginger flavors. And of course the vodka provides a little kick to the drink. 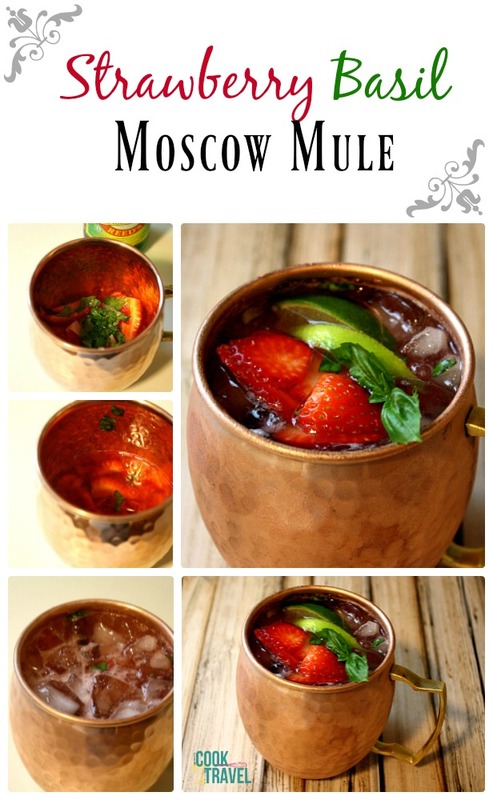 My only regret is that I haven’t been enjoying this Strawberry Basil Moscow Mule Cocktail all summer long!! I really loved it, and am pretty sure I’ll be making it a few more times in the very near future. So if you’re looking for a cocktail that highlights some classic summer flavors, then this Strawberry Basil Moscow Mule Cocktail is going to be the perfect addition to your next evening in. Click the link for the recipe and step by step instructions. Then go grab that copper mug and start sipping! Happy cocktailing!! One year ago: Fig, Prosciutto and Goat Cheese Pizza – Don’t Mind If I Do! Two years ago: Sriracha Shrimp and Zucchini Lo Mein = One Damn Good Dinner! 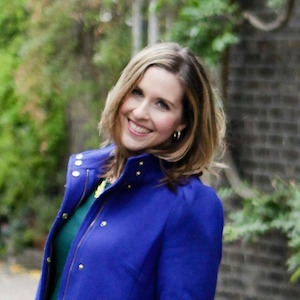 Five years ago: Cookies and Sea Salt…Really? !